A turtle baby boom on the Baguan Island of Turtle Islands in the Philippines has produced a record 1.4 million eggs according to Conservation International (CI) Philippines citing figures from the Department of Environment and Resources (DENR). In 2011, a total of 14,220 Green Turtle (Chelonia mydas) nests were counted on Baguan Island, the highest number since recording at the site began in 1984. This adds up to over 1.44 million eggs which will provide a huge boost to the population of the Green Turtle which is listed as Endangered on the IUCN Red List of Threatened Species™. Baguan is one of the nine islands in the Turtle Islands Heritage Protected area (TIHPA), a protected area which is jointly managed by two countries; Malaysia and the Philippines. Baguan is one of six islands in the Philippines’ Turtle Islands Wildlife Sanctaury and there are three islands located in Malaysia’s Sabah Turtle Islands Park (TIP). The nesting success has been attributed to the combined conservation efforts of CI Philippines, DENR, local government and the Malaysian park management authority Sabah Parks. A protection area was set up around Baguan and law enforcement to prevent poaching, egg collection and habitat destruction was strengthened by training park wardens, law enforcers and community volunteers. Patrolling efforts were also increased and the enforcements team included officers from the Philippine Coast Guard and Philippine Navy Marines. 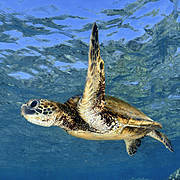 International Union for Conservation of the Nature Marine Turtle Specialist Group. Dr Nicolas Pilcher and Romeo Trono, who are both members of the IUCN SSC Marine Turtles Specialist Group, along with Dr. Mundita Lim and Renato Cruz at DENR, Joel Palma at WWF Philippines and Paul Basintal at Sabah Parks, who are all also members of the IUCN SSC Marine Turtles Specialist Group, have been leading turtle conservation projects in Malaysia and the Philippines for over 20 years. They have worked closely to link government agencies and NGOs and have developed a joint network of protected areas to safeguard turtles at all stages of their life cycles. Records kept by DENR show there are more Green Turtle nests on Baguan when the area is protected proving that conservation action and protection can work. 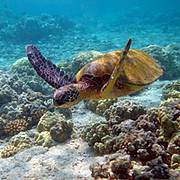 International Union for Conservation of Nature Marine Turtle Specialist Group.